BBC Attacks Atheist Ex-Muslims As 'Islamophobic', Defends Islamists. “#ExMuslimBecause we reject dogma, superstitions, notions of omnipotent sky tyrants, flying horses, talking snakes/ants, concept of hell etc”, tweeted the Ex-Muslim Forum, the group who started the hashtag. #ExMuslimBecause i know being a woman doesn't make me lesser. I shouldn't have to worship *behind* men, or be segregated from them. “We never expected [the hashtag] to start trending in this way… it really shows just how much people needed to express themselves”, explained Maryam Namazie, founded of the Ex-Muslim Forum, to the BBC. The BBC’s program featured presenter Anne-Marie Tomchak talking with two male Muslim “community experts”, almost exclusively about how the hashtag was “problematic” and “hateful”. 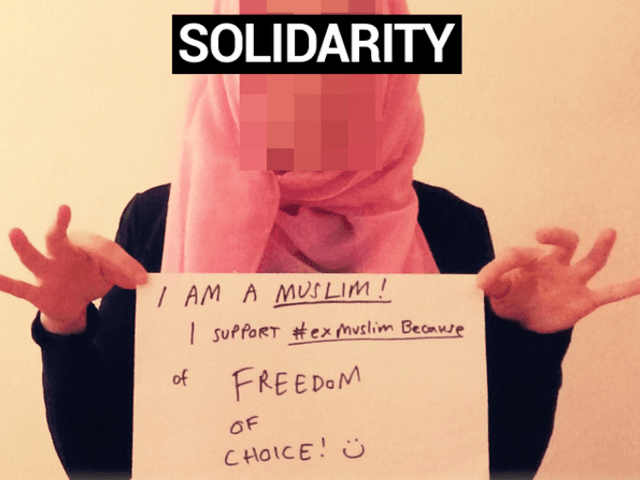 The words “Ex-Muslim” were put in quotation marks, as if to suggest ex-Muslims did not really exist, and there was little discussion about the bravery of the participants and the positive message behind the campaign. The presenter said Mrs. Namazie was adopting a “strident tone”. BBC journalist Mobeen Azhar said she was “uncompromising” and said some people think of her as an “opportunist”. “I think in terms of Maryam’s tone, it might make Muslims feel attacked again”, he said. However, Mrs. Namazie had already explained that, “being ex-Muslim is not being anti-Muslim. It’s just criticising an idea.” Plus, there is zero evidence of atheist ex-Muslims physically attacking Muslims, just their ideas. Maryam responded by explaining that killings and persecutions have been going on in the Muslim world for centuries, and to view this whole debate through the prism of the recent Paris attack is wrong. “Whilst we mourn our dead in Paris, we must not forget the countless others killed by ISIS and Islamists, including this very month in Lebanon, Nigeria, Mali, Iraq, Egypt, Bangladesh, Pakistan, Afghanistan… as well as those executed perfectly legally via Sharia laws in Iran, Saudi Arabia… The refugee crisis is in large part due to this unbridled brutality. “In fact, if there ever was a “right” time to challenge Islam and Islamism, it is now”. Ms. Tomchak and her “community experts” also attacked her use of the word “Islamist”, which signifies those committed to political Islam, who might be prepared to kill in the name of their religion. Ms. Tomchak said: “Quite a strident tone coming from Maryam Namazie and the way she uses the term Islamists”. Mr. Azhar added: “it’s quite uncompromising since there are many shades of grey amongst Islamists; lumping Islamists together is not going to be most helpful”. “Community expert” Mobeen Azhar appeared to think that the real victims of the Paris attacks were in fact Muslims. “To see Islam as the victim in the Allahu-Akbaring of 130 mostly non-Muslim Parisians is vile”, Tweeted Canadian ex-Muslim Ali A. Rizvi at the BBC journalist. “People are saying #ExMuslimBecause is “hateful”. How can telling people why you left a religion be “hate”? By what bizarrely twisted logic?” Tweeted Richard Dawkins. “The BBC should really be ashamed of for further silencing us by promoting the idea that somehow, SIMPLY STATING we are Ex Muslim and why is tantamount to Islamophobia, and for overwhelmingly interviewing Muslims on a show about Ex Muslims.